He called it vino rotkohl and the house filled with tantalizing aroma. I was a college student paying my way with bits of house cleaning at the time. My growing interest in international foods took hold at Les and Nann’s where soon I was helping with preparations and washing up for dinner parties. For its time the house was modern with lots of windows and set in a grove of trees at the town’s edge. Polished wooden floors were carpet free and a grand piano centered the living room. Often as I worked away with kitchen chores, the house filled with Mozart concerti. One Thanksgiving with the holiday too close to Christmas for the long trip home, I joined a group of campus stranded students around the Lindou table. The regal spread affirmed both our American traditions and their European travels. There was turkey with braised red cabbage and for the first time in my life wine with dinner. This morning as I stood in front of a supermarket vegetable display, I picked up a red cabbage and remembered Les’s vino rotkohl. It’s best as a do ahead vegetable and will always taste better the next day. Any detail not needing last minute attention is a bonus. 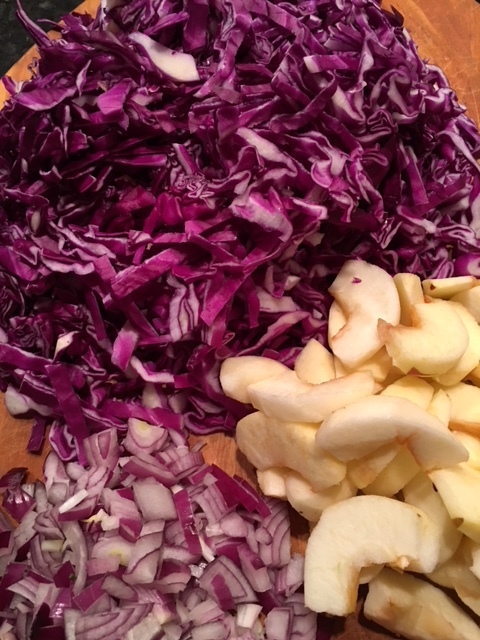 The red cabbage may be prepared a few days ahead. It brings tempting color and a sweet/tart that flavor that will enliven the sometimes bland turkey. 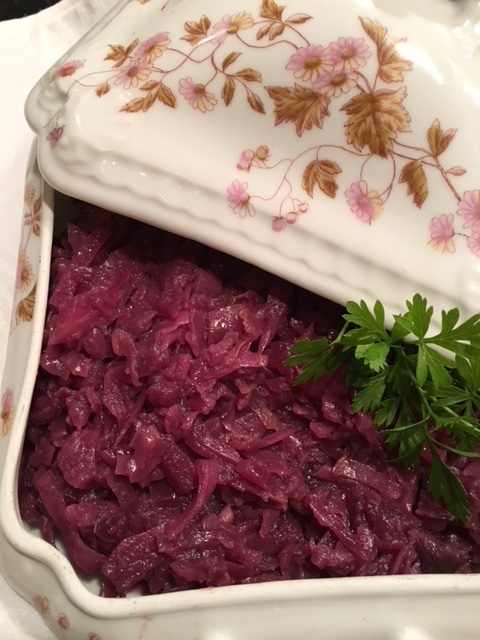 It’s great with leftovers or spooned into a turkey sandwich; braised red cabbage is definitely a keeper. 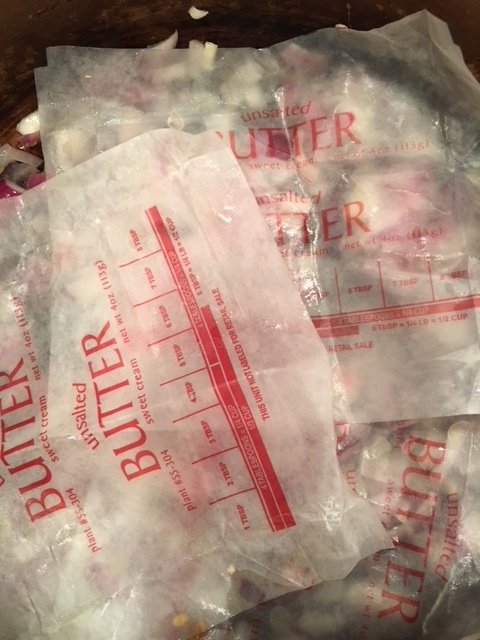 In a heavy casserole with a tight fitting lid, melt the butter or heat the oil and gently sweat the onion (cover with butter wrappers to retain moisture) until translucent, 6-8 minutes. Add cinnamon stick, grated ginger and stir in the shredded cabbage. Season with salt; add wine or cider, vinegar and sugar. Top the cabbage with sliced apples. Cover and simmer gently (return the butter wrappers before topping with lid) 30-40 minutes or until the apples have pulped and the cabbage is meltingly tender. Check during this slow cooking period to make sure the cabbage isn’t dry; add a few spoonfuls of cider or water if necessary. When the cooking is complete, stir the soft apples into the cabbage and remove cinnamon stick. Serve straight away or cool, chill and reheat when needed. Serves 8. You are currently browsing the Mary Jo's Kitchen blog archives for November, 2017.